Testing battery life of the head lights and new taillights. 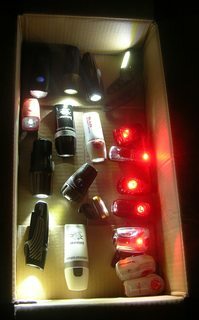 Visit the Bike Light Database for the most recent bike light reviews and for a frequently updated list of the best bike headlights! Last year I wrote a review of bike taillights that turned out to be quite popular. I’ve been asked when I’m going to do a similar review for headlights, and I'm pleased to announce that the results are now in! Over the past few months I’ve been testing about a dozen different headlights. So far I’ve mostly been using them in my daily biking travels, getting a sense for their real-world pros and cons. In addition to my personal impressions, I've compiled information about battery life, brightness, and other features. Later on I'll be adding in more quantitative brightness measurements and taking beam comparison pictures. In case you missed it, I've also been trying out some new taillights, which you can read all about in the 2013 Taillights Review. The Cygolite Hotshot, winner of the 2012 taillight review. Visit the Bike Light Database for the most recent additions to the bike taillight reviews and for a frequently updated list of the best bike taillights! I covered a large number of taillights last year, but some new products have come out since then, so I've been taking them out for some rides to get a sense for how they stack up. Almost all of the new lights in the past year have been rechargeable - AA(A) powered lights are declining in popularity, and for good reason. It's easy to spend $15-20 per year on batteries (if not more), so paying a little bit more for a rechargeable makes sense. The winner of the 2012 tail light review was the Cygolite Hotshot. At the time, it stood out for its brightness, versatility, and for being the only reasonably priced rechargeable on the market. 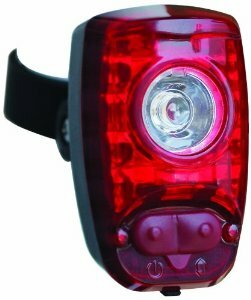 Cygolite hasn't released a new taillight in the past year, but there's a lot more competition in this category now - bright, rechargeable lights in the $30-50 range. Why choose a rechargeable light over a standard light + a set of standard NiMH rechargeable batteries? (If you do go this route, get Sanyo Eneloops - everybody says they're the best rechargeable AAAs for lights.) First of all, energy density: Li-Ion batteries can hold about 3x more energy in the same space, and also retain their energy capacity over more discharge cycles. Additionally, most rechargeable lights have a built-in voltage regulator to prevent the brightness from dropping off as the battery drains. Most AA(A) lights do not have this, and start dimming almost immediately once you begin to use them. Rechargeable NiMH batteries also start at only 1.2V (vs 1.5V for a standard alkaline AAA battery), which means your light will be dimmer from the get-go. And finally, with so many affordable choices now for rechargeable lights, it's not even any cheaper to go with rechargeable AAAs, since a charger + batteries will cost more than it would cost to go for a more expensive but rechargeable light.